Liberty Tax Reviews: Right Tax-Filing Service for Your Situation? Liberty Tax Review: Is It the Right Tax-Filing Service for Your Situation? Liberty Tax is a chain of tax preparation franchises that emphasize in-office visits and promotions, yet also offers online tax software for those who want to do DIY taxes. Perhaps the most well-known aspect of Liberty Tax is their street-sign promotions, in which they dress someone up as the Statue of Liberty. 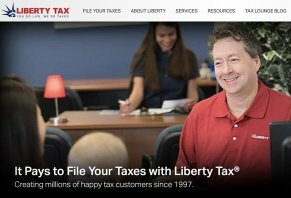 According to the company’s About Us page, Liberty Tax started in 1998 when founder John Hewitt opened five U.S. offices. More than two decades later, the company has surpassed 3,000 offices. It is based in Virginia Beach, VA.
“We continue to provide our unique range of tax preparation services and expand our presence in the competitive personal income tax industry,” their site says. In this review, we’re going to discuss the types of tax services Liberty offers, the promotions it was running at the time of publishing and discuss the differences between doing your taxes in-person with a tax preparer as opposed to doing it online. As we mentioned in the introduction, Liberty Tax does in-office tax preparation and also offers an online tax software platform. The company uses a variety of promotions that are based on in-office visits, which is why we emphasize this aspect of the company’s operations more than we did with competing tax preparer H&R Block, who also uses a hybrid model of offices and online software. The company doesn’t advertise a minimum fee for an in-office visit – how much your preparation services cost depends on the complexity of your review and how much your local office charges. What we do know is that their in-office visits are considerably more expensive than their online software, which we’ll talk about in a few seconds. In preparation for our series of tax articles and reviews, we called a local Liberty Tax to get a sense of how much a basic tax return (W-2, dependents) would cost to do in an office with a tax expert. The person with whom we spoke told us the fee would be $215 and that if I was claiming the Earned Income Tax Credit, the cost would be around $400. Keep in mind that, because these offices are franchised, prices may vary from office to office or city to city. Now, considering how expensive it is to do an in-office visit for even a basic tax return, you might be wondering why someone would get their taxes done at a Liberty Tax office. The answer is wrapped up in Liberty Tax’s tax refund advances and free phone offer. The company offers to give you your tax refund in advance for no fee if you come into their office to do their tax return. These refund advances can be a huge help if you need the money fast and can’t wait for the IRS to process your return and send you your refund. However, remember that your desire for quick cash can be expensive – at least $215 for a tax return you could do online in around 30 minutes or less for $30 or less. At the time of writing, Liberty was also offering a free two-month subscription to mileage tracking app MileIQ. The final main promotion the company ran at the time of writing was a $50 discount on your tax services if you referred a friend who used Liberty. A few things here are important to point out. First, Liberty doesn’t offer free online filing. Other sites do and, if you have a simple return (one W-2, no kids, not a homeowner, no investments), other sites may be a better fit because you might be able to file free with them. Second, state taxes range from $29.95 (Simple) to $39.95 (Basic, Deluxe, Premium). Based on our research, we believe that Basic is a great option for those who have dependents (children, relatives you’re taking care of), homeowners and those who pay student loan interest. Deluxe is a good fit for you if you have a sole proprietorship and you want to take the home office deduction as well as other work-related deductions. Premium is the top tier among Liberty’s tax software and is designed for most tax situations, including those who sold a home, have rental properties, have capital gains and/or are part of an S-Corporation. We did a quick overview of the existing customer reviews about Liberty Tax and found a lot of complaints about the company’s pricing, as well as a few positive reviews from returning customers. Most of the complaints noted that Liberty’s fees were higher than expected and that the person who was doing their taxes didn’t seem as proficient as they should have been. What makes these reviews tough is that the quality of your tax preparation may change from location to location because each office is a franchise in which the franchisee hires staff and dictates pricing. Liberty Tax’s in-office visits are hard to compare to H&R Block because the pricing they offer is going to vary based on your unique tax situation. What this chart doesn’t include is the free filing tier, something that makes Liberty Tax different than the competition because it doesn’t offer free online filing. As far as the data that we’ve included in this chart, Liberty’s filing tiers are the second-highest and their state taxes for the Deluxe and Premium tiers are also the second-highest. The company doesn’t offer an app, which is another drawback, in our opinion. In general, we think the data in this table reveals that Liberty Tax isn’t the best option for online filing because other sites have cheaper prices as well as apps that make filing taxes easier. However, we’d like to point out that Liberty Tax seems to put more focus on its in-office tax preparation services as opposed to its online tax software. Based on this, then, it makes sense that their online offerings don’t measure up (in our opinion) to TurboTax, H&R Block, TaxAct and TaxSlayer. Based on all the research and analysis we’ve done about Liberty Tax as well as other popular tax services, we believe that the company's greatest strength is that It's one of the few that offers in-office tax return advances. For someone who has a basic tax return that typically gets a tax refund of thousands of dollars, paying a $200 fee for in-office preparation could be worth getting an advance on their return. Also, we like how Liberty Tax offers various ways to save money on their preparation fees. In addition to the promotions we listed earlier in this review, past customers have said that their local office offered further discounts for bringing in items for a canned food drive. If you want to use the Liberty Tax office in your area, call them ahead of time to find out which promotions you can take advantage of. That being said, we believe there are some clear disadvantages to using Liberty Tax. First, the company’s in-office services don't’ have a set price, which means there may be situations in which your final bill is much higher than you expected. A good rule of thumb is that your prices will jump higher for each “Schedule” you use. These Schedules are worksheets that calculate deductions for things like mortgage interest, business profit and loss, capital gains and other situations. The difference between in-office visits and online tax software is that the price hikes for additional schedules are much lower online than in-person. The other downside to Liberty Tax is that their prices for their online filing options are higher than every competitor but TurboTax, and, considering TurboTax’s sterling reputation for online filing and the fact that you can have access to a CPA or EA for, at most, $169, we think there are better options than Liberty Tax for tax software. If you aren’t convinced that Liberty Tax is the right choice for you but you’re hesitant to try online tax software, read through our guide to the best tax software of 2019. This guide will help you understand what the main tax sites can do, how much they cost and which website might be best for your particular situation. Write a Review for Liberty Tax!